For energy to keep up with your students, lesson planning, grading, and the many additional things that go on behind the scenes. We pray for encouragement when you’ve already spent all of your energy for the week, but it’s only Wednesday. Thank you for your dedication and perseverance. For wisdom when you face a difficult situation, whether it includes students, parents, teachers, or other school faculty. We pray for discernment as you navigate your way through the facts and emotions, seeking to serve others both justly and fairly, but also with kindness and compassion. Thank you for your grit and grace. For perspective—to remember why you started this journey of challenging and shaping the minds of the rising generation. We pray you will trust that the seeds you’re planting will grow over time, even if you cannot see the outcome as soon as you’d like. Thank you for your selfless giving. For blessings to be poured upon you. We pray that there will be students who touch your heart and give you the motivation to press on. We pray for parents of students to see your worth and value, and to speak words of affirmation and thanks to you. 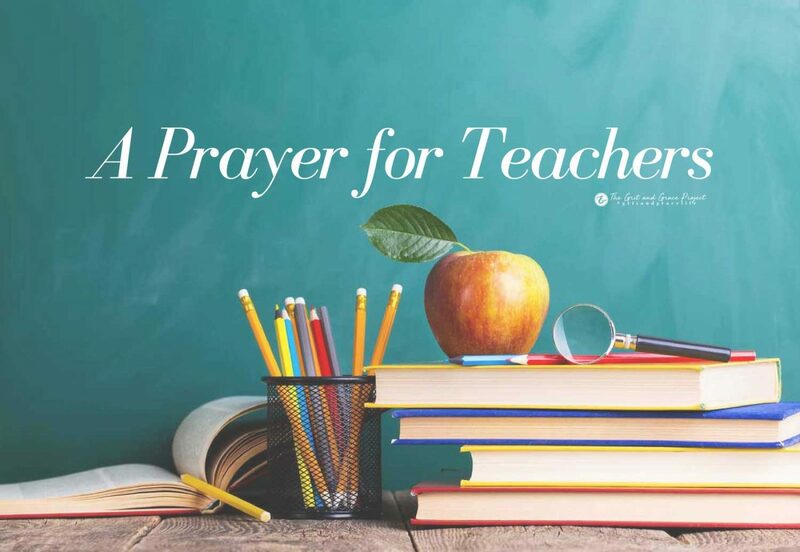 We pray that you will be a leader among other teachers—that they will be inspired by who you are, your work ethic, and the way you teach and care. We know that you give above and beyond the job requirements… Mentally, physically, emotionally, and oftentimes even financially—using your own income to help cover some costs that aren’t necessarily your burden to bear. We ask that you will be abundantly cared for and provided for, just as you are doing so for others. You are noticed, appreciated, and covered in prayer. To all of our teacher friends, thank you. We will keep praying for you.